The Irgun (Hebrew: ארגון‎), (full title: Irgun Zevai Leumi) (from Hebrew: הארגון הצבאי הלאומי בארץ ישראל‎, "The National Military Organization in the Land of Israel"), was a Zionist paramilitary group in Palestine between 1931 and 1948. Irgun is best known was the bombing of the King David Hotel in Jerusalem in 1946. In the 1940s, Irgun was labelled as a terrorist organization. 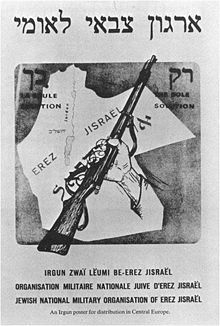 Irgun is considered an early version of Ḥerut which was an Israeli political party. Irgun is also an early version of today's Likud political party in Israel. ↑ 1.0 1.1 1.2 1.3 "Irgun Zvai Leumi", Encyclopædia Britannica; retrieved 2012-5-31. ↑ Eisenstadt, S.N. (1985). The Transformation of Israeli Society, pp. 173–174. This page was last changed on 17 May 2018, at 09:52.